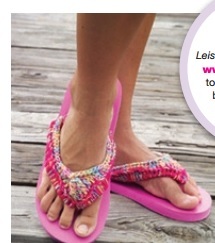 Crochet an easy pair of flip flops for summer. A fun way to spruce up a pair of inexpensive flip flops is to decorate them with a crocheted flower or add some yarn and beads around the flip flops. You can make a pair of white or black flip flops into another color by just adding crochet around the top of the flip flop. This pattern was also found free uploaded in PDF format at the Leisure Arts Website it is free when you search in a search engine . This light & colorful afghan is a great way to use up all those little balls of scrap yarn. Each flip-flop square is made individually from worsted weight yarn and then sewn together. 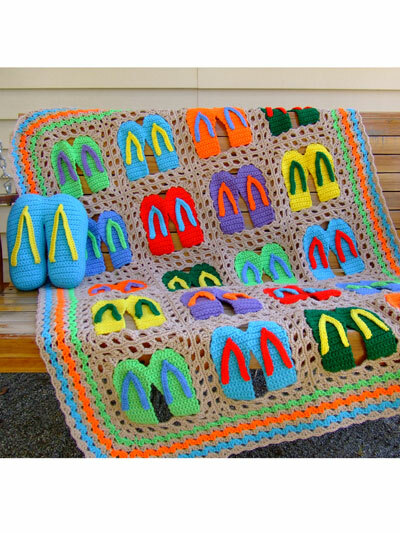 Pattern also includes instructions for a flip-flop pillow. Afghan is 43" x 53", and pillow is 10" H x 9" W x 3 1/2" D.